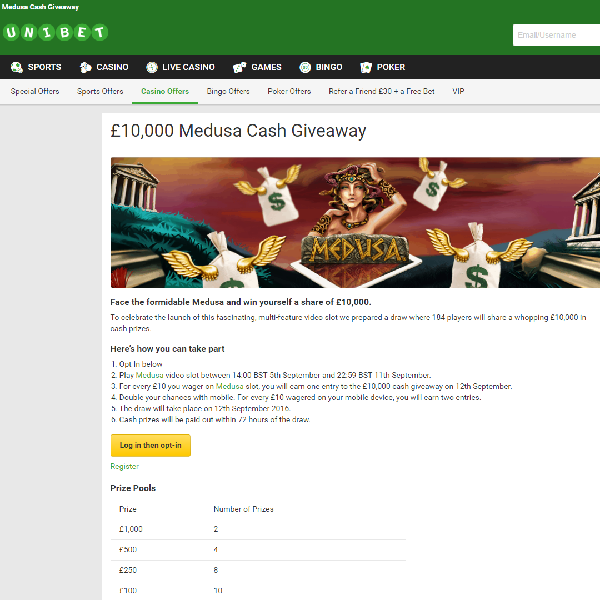 Unibet Casino is giving its members the chance to win a share of £10,000 in cash in its Medusa Cash Giveaway. The promotion is to celebrate the launch of the casino’s latest slot and there are a massive 184 prizes up for grabs. All you have to do is opt in to the promotion and play the game between now and 11pm on Sunday. Each £10 you bet on the game will earn you an entry to the prize draw and if you play on mobile you will receive double entries. There is no limit on how many entries each member can receive. There are 2 prizes of £1,000, 4 prizes of £500, 8 prizes of £250, 10 prizes of £100, 20 prizes of £50, 40 prizes of £25 and 100 prizes of £10 up for grabs. Head over to Unibet and start playing today.